This bread is used as the basis for Navajo Tacos and can also be folded over a stuffing and eaten as a sandwich. At special events through the Southwest they are cooked in large round pots over open mesquite fires by Native Americans. 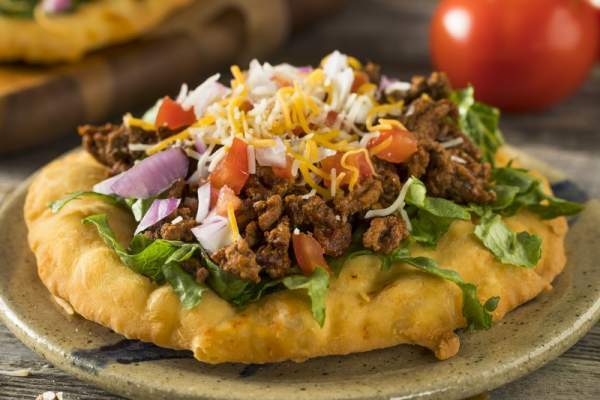 Fry Bread is often served sprinkled with confectioners' sugar or drizzled with honey. Sometimes chopped onions and chiles are mixed into the dough. The Ute tribe forms the tortillas in the same way as fry bread, but they cook them over a charcoal grill outdoors or over an open fire. This method also makes delicious Fry Bread. Fry Bread is served on the plaza at San Xavier Mission Del Bac (White Dove of the Desert) in Tucson, pow wows, rodeos, etc. Measure dry ingredients into a deep mixing bowl. Add shortening and knead with hands until dough is in small pea-size pieces. Add warm, not hot, water and knead with hands until dough is smooth and leaves sides of bowl. Knead for at least 5 minutes. Divide dough into portions about golf-ball size and pat, slap, or roll out as round as possible, 1/4 inch thick. Fry in hot shortening or oil about 1 inch in depth. Fry both sides until light golden, not dark brown. Top with refried beans, confectioners' sugar or honey. From the kitchen of Linda Jolly.